A week older, a week wiser, a week closer to getting rid of this ringing! Through the Tinnitus Miracle I’ve learned heaps about my ears and how to better understand my ear canal, brain influence, and overall health. In the first part of the Tinnitus Miracle, Thomas talks about anatomy and its part in clear hearing (pg. 17 if you are following along). You probably were thinking to yourself, “why is this in here, are we in high school all over again?” After reading more, I was surprised that I learned things that I’ve never known about previously. 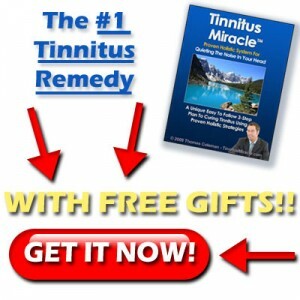 There is very useful and concrete advice that has helped me understand this body that I’m in and utilize my energy to conquer the symptoms of tinnitus. First, I know what the doctors have told me about stress, OTC drugs, and definitive hearing loss, I understand my conditions MUCH better after going through Thomas’ detailed, yet very easy to read breakdown of the way we hear (page 22-24). What goes on in the canal and its link to the brain and how the ringing is developed and how it is all interpretted in the hearing process. It is such good information and put visuals in my head to clarify more. The West and its medicinal properties have just led me to believe that my Tinnitus is uncureable and I just have to buy treatments over and over again. The money is in the medicine and not the cure, but WHY??? I frequently think about how many people are being scammed just so that pharmaceutical reps can make more money and keep their lavish lifestyles up. So, Thomas asserts that knowledge is powerful (READ THIS PART). In this, Thomas offers a great and unique way of identifying where you need to focus on your hearing cycle and understanding that hearing is not just one simple system (pages 45-48) and that you have to take in different aspects. All of this is really mindblowing and nothing I’ve heard from any doctor visits or “tinnitus counselors”. I keep a daily log of when I experience the most tinnitus symptoms and record what is going on around me so that I can calculate different stressors. After seeing everything and being aware of my surroundings, we are able to pinpoint different parts that could be triggereing the tinnitus. It’s all coming together! Thomas discusses a decent amount of ways to understand triggers, but I’ll save those for my next post. This entry was posted on Sunday, March 8th, 2009 at 10:47 pm	and is filed under Progress, Tinnitus Miracle. You can follow any responses to this entry through the RSS 2.0 feed. You can leave a response, or trackback from your own site.